Repeater pipettes, available in both manual and electronic formats, are ideal for repeatedly dispensing the same volumes multiple times into multiple receptacles without having to aspire in between each dispensing step, thus increasing speed and efficiency. 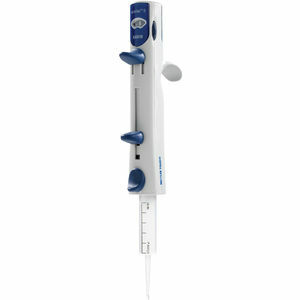 Not only does Pipette.com carry models of repeater pipettes in manual and electronic, but also single channel along with multichannel formats. This makes dispensing liquids into 96 well plates a breeze, allowing you to increase production and remove movement waste. Reducing the time between dispenses, repeater pipettes are able to increase productivity to a new level in the laboratory, while reducing RSI occurrences related to aspirating liquids. They are ergonomic and accurate, with versatile dispensing volume ranges. Whether you are repeatedly pipetting small increments of 1 µL or larger repeatable volumes of up to 50 mL, a repeating pipette is essential for completing same volume dispensing in a timely manner. Designed with ergonomics in mind, these light weight and single hand operation repeater pipettes will allow a single operator to work at a throughput capacity. Manual repeater pipettes are an economical and effective method for reproducing constant measurements of the same volume of liquid. Requiring no batteries or charging along with optimal dispensing levers for easy thumb movement, manual repeater pipettes are ideal for laboratories that focus on cost effectiveness and accuracy. With ergonomic grips, easy to read digital displays, and electronic pipetting, these electronic repeater pipettes reduce RSI by a large amount and come with automatic tip volume recognition. Equipped with continuous and easy adjustments for a wide range of volumes, electronic repeater pipettes help remove human error while maintaining safety and precision. Dividing or aliquoting a liquid or sample into multiple individual aliquots. Adding an assay component or liquid to multiple wells on a microplate, or washing multiple wells on a microplate quickly, when a multichannel pipette is unavailable or inappropriate. Repetitive dispensing of the same volumes of a dense, viscous or volatile liquid e.g. glycerol, ethanol. Dispensing the same volume into multiple wells on a deep well microplate e.g. 1 mL deep well 96 well plate. Performing multiple reactions in tubes rather than plates. No need to aspire between each repeated volume dispensing step, saving time. When multichannel pipettes are outside of your budget, repeater pipettes are a great cost-effective method of increasing the efficiency of repeat pipetting the same volume of the same liquid. If you still seek multichannel pipettes, there are multichannel repeating pipettes that increase productivity beyond that of a regular repeator. Wide volume ranges per pipette, via attaching different sized syringe tips/cartridges, thus being cost effective. Positive displacement syringe tips ensure accuracy and repeatability even when pipetting highly dense, viscous or volatile liquids. Positive displacement syringe tips also help prevent bubble formation and foaming in detergent containing liquids. 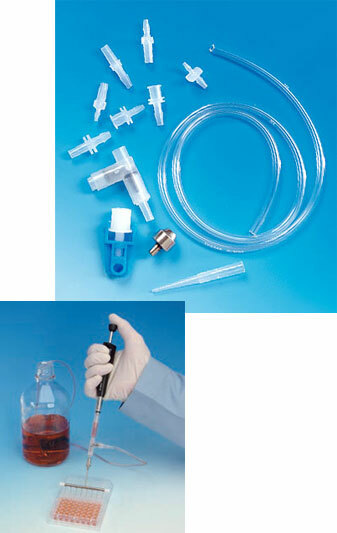 Pipette.com carries a full line of Repeater Syringe Tips for all major brands of repeaters. 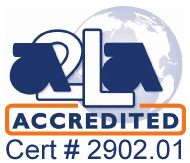 New customers receive 10% OFF calibration service, including Repeater Pipette Calibration Service with Pipette.com. NichiMate Stepper has up to 40 different volumes from 1µl to 5000µl available. A lightweight and slender grip allows for fatigue-free operation . High accuracy and precision guaranteed. Model 2100G Digital Hand-held Dispenser provides continuous dispensing from most types of containers. Lightweight design allows for one-handed operation. Plastic housing protects the glass cylinder and plunger. All of the parts which come in direct contact with the liquid are autoclavable. Four models provide dispensing from 0.2µl to 10ml . Model 8100 has 35 ways of dispensing in the volume range between 1 and 5000µl. Fast change of syringe and volume adjustment dial. Light and slender design permits easy handling without fatigue. Autoclavable syringe (except 3.0 ml and 60 ml). Model 8800 8-Chanel Variable Repetitive Syringe Dispenser can dispense 6 different volumes of liquid (10,20,25,40,50,&100µl) into a microtiter plate. Lightweight and slender design allows for easy handling without fatigue. All syringes and cartridges are autoclavable.